Photographing destination weddings is such a joy, especially when you can encourage your bride and groom to create fun images. 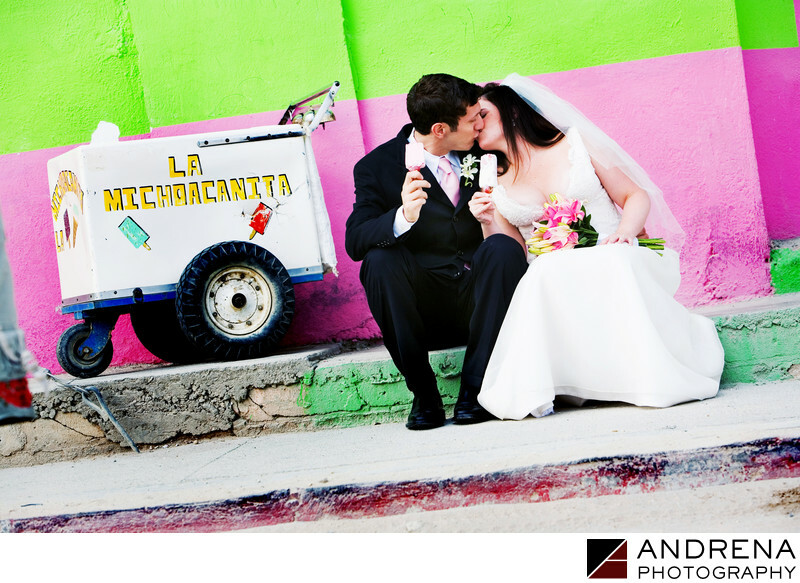 So many people love this simple image of a bride and groom kissing while enjoying ice cream pops in Cabo San Lucas, Mexico. Part of the reason is the colorful background, but people also mention the fun connection between the bride and groom. What the viewer doesn't know is that it was about 105 degrees with tons of humidity, so we were all sweating to death, particularly the groom. But he was a champ, and though he was dripping with sweat, he didn't complain once. This cute couple's wedding took place at the Dreams Resort in Los Cabos, and all-inclusive resort property that was the perfect setting for this Jewish wedding. Destination Jewish wedding photographed at the Dreams Resort in Los Cabos, Mexico.